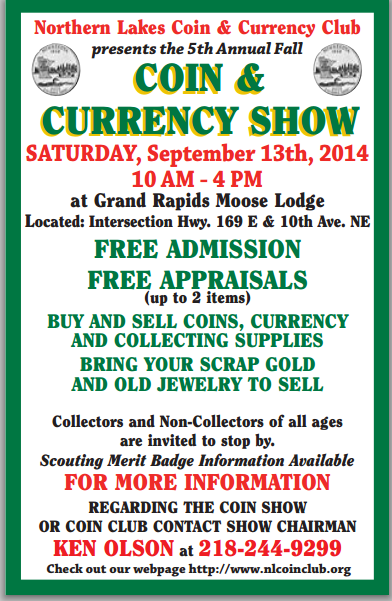 can get a preview and first chance to purchase items that will be for sale at our regular Coin Show on Sept. 13th. For more info, contact Ken Olson 244-9299. If you plan to bring anything to sell, please call me 244-9299 or send me an email reply so I know how much space you need. Please be to the Clubhouse by 6:00 if you intend to sell items so we can arrange locations. Since it is hard to bring enough inventory to satisfy everyone’s “Want Lists”, if you have certain coin, currency or bullion items you are looking for, please contact me 244-9299 or email me and I will let each of the persons who are selling know about your requests.